Rabbit polyclonal FLI1 antibody. Validated in WB, IP, IHC, ChIP, CHIPseq and tested in Mouse, Human. Cited in 28 publication(s). Independently reviewed in 3 review(s). Synthetic peptide within Human FLI1 aa 400 to the C-terminus (C terminal). The exact sequence is proprietary. Our Abpromise guarantee covers the use of ab15289 in the following tested applications. WB Use a concentration of 2 µg/ml. Detects a band of approximately 51 kDa (predicted molecular weight: 51 kDa). IHC-P 1/50. Perform enzymatic antigen retrieval before commencing with IHC staining protocol. Defects in FLI1 are a cause of Ewing sarcoma (ES) [MIM:612219]. A highly malignant, metastatic, primitive small round cell tumor of bone and soft tissue that affects children and adolescents. It belongs to the Ewing sarcoma family of tumors, a group of morphologically heterogeneous neoplasms that share the same cytogenetic features. They are considered neural tumors derived from cells of the neural crest. Ewing sarcoma represents the less differentiated form of the tumors. Note=A chromosomal aberration involving FLI1 is found in patients with Erwing sarcoma. Translocation t(11;22)(q24;q12) with EWSR1. Chromatin was prepared from nuclear lysate of the mouse haematopoietic progenitor cell line HPC-7. The cross-linking (X-ChiP) technique was used, crosslinking was performed for 10 minutes in 0.4% and 1% formaldehyde. 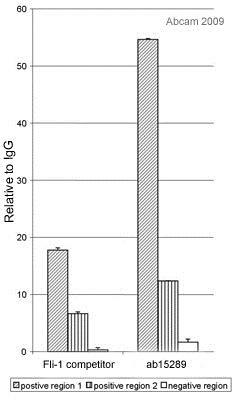 The primary antibody was used undiluted and incubated with the sample for 16 hours at 4°C. The immunoprecipitated DNA was quantified by real time PCR. Additional bands at: 77 kDa. We are unsure as to the identity of these extra bands. ab15289, at 1/50 dilution, staining FLI1 in angiosarcoma by Immunohistochemistry (FFPE-sections). Publishing research using ab15289? Please let us know so that we can cite the reference in this datasheet. Hi, I would like to know what is the concentration this antibody which I ordered before? The concentration of Anti-FLI1 antibody - ChIP Grade (ab15289) lot GR320740-1 is 0.105 mg/ml. Inquiry: Hi, would it be possible to obtain the sequence of the immunogenic peptide used to raise these antibodies ? or at least a slightly more precise information about the localization in the Cterminus of Fli1. Indeed I am trying to validate some results obtained with an antibody from another company and wants to make sure that it's not the same !!! Unfortunately the exact immunogen sequence is confidential. I can tell you it is located within aa 385-452 of Q01543 (Uniprot). So what is the difference between ab15290 and ab15289? 17 out of 19 aa are homologous for both antigens or just one of them? Thank you for your enquiry and your interest in our products. The antigens for these two antibodies are the same, however ab15290 is prediluted so so you use it without any further dilution.